Creating interactive 3D environments (VR or not) generally requires strong 3D modeling skills. In this workshop you will learn the minimal methods, skill-sets, and tools necessary to construct 3D models operable in VR environments . 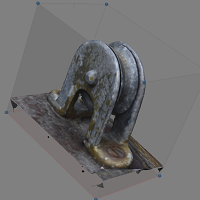 Using photogrammetry we can take photos of objects and, with basic techniques in modeling software, we can turn our photographs into 3D models realistic enough to be suitable for up close viewing in VR. This multi-part workshop will start with the basics of photogrammetry with Photoscan, then show how to clean up your generated models in Maya, and finally show how to use and interact with your models in VR using Unity Game Engine. There will be three workshops in this series. You are not required to come to every one, but consistent attendance is highly recommended.